An accurate diagnosis of disease is important for successful implementation of an IPM program. Different pathogens are controlled by different fungicide chemistries. Bacterial diseases are not controlled with fungicides, and some bacterial diseases are easily mistaken for fungal diseases. Some fungicides have a narrow spectrum of activity. Abiotic factors such as high soluble salts, nutrient imbalances, or chemcial injury can mimic the symptoms of plant pathogens. In addition, if you know the disease, you can usually find information regarding the environmental conditions necessary for disease development. You could also find out if the pathogen is seed-borne, soil-borne, and whether other crops in the greenhouse are susceptible. The ability to make an accurate diagnosis on-site is dependent on a disease that has unique symptoms. Also, the grower needs to have previously identified the problem, or have a good illustration or written description. There are a number of diseases that can be easily identified on-site, and there are many that can only be diagnosed in a lab. 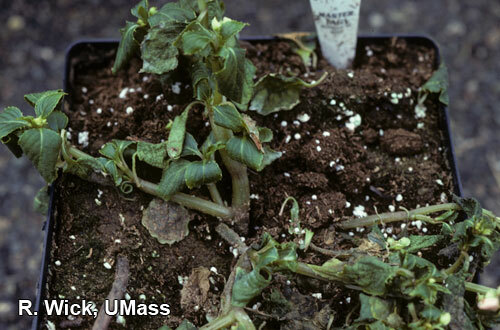 If you are a Massachusetts commercial flower grower and are unsure of the cause of symptoms, you can send a specimen to the UMass Extension Plant Diagnostic Lab. Damping-off and Root Rots. Of all of the diseases, damping-off and root rot are the most difficult to identify on-site. Pythium and Rhizoctonia are the two most common causes, but they usually do not leave any clues as to their identity. Also, they have a wide host range, so the plant they occur on does not supply a clue. When Rhizoctonia is causing web blight, you can see the brown strands of mycelium on the diseased plants. Webbing occurs when temperature and humidity are high. There are test kits available that can allow you to make an accurate on-site identification of Pythium, Phytophthora and Rhizoctonia. Soft-Rots. Cuttings have a large wound on the base and can be very susceptible to Erwinia soft rot, especially when temperatures are in the 90's and there is plenty of water. When Erwinia is the cause, the base of the cuttings become soft and slimy. If the cuttings are diseased but remain firm, there is another cause. Poinsettias are subject to a rapidly developing soft rot by the fungi Rhizopus, Choenephora, and the bacterium Erwinia. These can be difficult or impossible to identify on-site; however there are no effective fungicides or bactericides. Simply discard the plants. Bacterial Blight of Geranium. Bacterial blight of geranium is caused by Xanthomonas campestris pv. pelargoni. Wilted plants will not have root rot or stem canker (unless there are several diseases occurring). At first, one or two leaves will become soft and droop. Root rot or high soluble salts can also cause wilt but usually the whole plant wilts. Another good indication of X. c pv. pelargoni is leaf spots, but they do not always occur. Ralstonia (Pseudomonas) solanacearum can also cause a systemic wilt of geranium but does not cause leaf spots. We rarely see Ralstonia in geranium in New England but we had several cases in 1999, 2002 and 2004. Ralstonia solanacearum Race 3, Biovar 2 is a federally quarantined pest (USDA-APHIS) and Massachusetts Department of Agricultural Resources (MDAR) must be contacted and a rigorous eradication program undertaken. X. c pv. pelargoni only infects geranium but Ralstonia infects a variety of ornamentals and vegetables including potato and tomato (as well as tobacco and banana). Bacterial Leaf Spots. Bacterial leaf spots can look very similar to fungal leaf spots but when you hold them up to the light (as if to see the light through the leaf), bacterial spots may have a translucent look to them. On geraniums, you may see a yellow halo around the spots. Bacterial spots on impatiens can be distinguished from Alternaria leaf spot because Alternaria causes the leaf to become yellow. Pseudomonas syringae and P. cichorii cause leaf spots on geranium, chrysanthemum, and many other ornamental plants. Affected leaves do not wilt. Fungal Leaf Spots and Blights. There are many fungi that cause leaf spotting of floricultural crops. With experience, some can be recognized but most cannot be identified on-site. Alternaria on zinnia (photo), impatiens and Gomphrena is relatively easy to identify. Botrytis (photo) is easy to identify when it is producing its gray crop of spores. On Fuchsia (photo), Botrytis causes cankers which usually do not develop spores, but cankers on Fuchsia are almost always caused by Botrytis. Powdery Mildew. (Photo) This disease is easy to identify because of the white to gray, powdery crop of spores it produces on the leaf surface. In most cases, powdery mildew develops on the top side of the leaf but on poinsettia and a few other plants, mildew will also grow on the bottom. African violet, Begonia, Dahlia, Gerbera, Hydrangea, Kalanchoe and pansy, commonly develop powdery mildew. On Kalanchoe, powdery mildew can be difficult to recognize because only a fine webbing will develop. Powdery mildews are host specific and spread only to closely related plant hosts. Downy Mildews are becoming more prevalent in ornamental crops, particularly basil (photo), coleus, and snapdragon, and are difficult to identify without a microscope. Symptoms can be mistaken for nutrient imbalances or bacterial diseases. Symptoms occur on leaf undersides where the fungus sporulates as a fuzzy, white or gray to purplish growth. These fungi are relatives of Pythium and Phytophthora and are managed by different fungicides than other leaf-spotting fungi. Rusts. Like powdery mildew, rust diseases are easy to identify. The rust fungi produce pustules of spores on the bottom side of the leaf. The pustules contain masses of rusty to orange colored spores. Snapdragon (photo), Fuchsia, carnation and geranium are susceptible to rust diseases. Fusarium and Verticillium Wilt. Diseases caused by these fungi initially affect only one side of the plant. Foliage on the affected stems will wilt and usually become yellow. There may or may not be discoloration in the vascular tissue (cutting into the stem will reveal a dark stain). It is difficult to diagnose these diseases with much confidence in the field. With cyclamen, several leaves will turn yellow. When you cut through the corm (cut the top off) you will see a dark band of vascular tissue that corresponds to the location of the yellowed leaves. These two vascular wilt fungi are not commonly seen in greenhouses. When they do occur, it is usually on chrysanthemum (photo), cyclamen or basil. Foliar Nematodes. These nematodes are likely to have been introduced into the greenhouse on cuttings. They produce different symptoms depending on the host. On Begonia, leaves can take on a reddish coloration before developing dry patches. On chrysanthemum, foliar nematodes produce distinct black lesions that are bordered by the leaf veins. African violets may form necrotic patches on the bottom of the leaves, and newly developing leaves can be distorted. The foliage of Easter lily becomes twisted. Photo of foliar nematodes on Heuchera. Viruses. Virus diseases can be very distinctive, or on the other hand, impossible to recognize. The most common virus in greenhouses is Impatiens Necrotic Spot Virus (INSV). While not all plants are hosts, the host list is at least 500 species long. The symptoms vary considerably from plant to plant but once you can recognize INSV on a specific plant you can usually identify it the next time it occurs on the same host. Very reliable test kits that are easy to use are available for testing INSV on-site. Other viruses can produce distinct symptoms but for the most part, cannot be reliably diagnosed outside of the lab. Viruses should be identified accurately because they are carried by different insect vectors, and have different host ranges. Identification of diseases caused by fungi, bacteria and nematodes, and INSV testing can be obtained at the UMass Extension Plant Diagnostic Lab, #3 French Hall, 230 Stockbridge Road, Amherst, MA 01003. Fee per specimen, $50.00. Identification of viruses of all kinds is available from Agdia Testing Services. 30380 County Road 6, Elkhart, IN 465124. (800) 622-4342. Call for pricing. On-site test kits for Xanthomonas camptestris pv. pelargonii, INSV and TSWV. Agdia Testing Services. 30380 County Road 6, Elkhart, IN 465124. (800) 622-4342. Call for pricing. It is a good idea to collect references that you can refer to for solving problems, or to simply learn more about your business. The following is a list of books on diseases of floriculture crops, and other ornamentals. If you are visiting the diagnostic lab in Amherst, you can take a look at most of these references. Files should also be kept on trade journal articles, fact sheets and diagnostic reports. The "Compendium" series by APS Press is available at (800) 328-7560. Ball Field Guide to Diseases of Greenhouse Ornamentals. 1993. Daughtrey, M. L. and Chase, A. R. Ball Publishing, Chicago, IL 224 pp. Compendium of Chrysanthemum Diseases. 1997. Horst, R. and Nelson, P. APS Press, St. Paul, MN. 88 pp. Compendium of Ornamental Foliage Plant Diseases. 1987. Chase, A. R. APS Press, St. Paul, MN. 100 pp. Compendium of Rhododendron and Azalea Diseases. 1986. Coyier, D. L. and Roane, M. K. APS Press, St. Paul, MN. 65 pp. Compendium of Rose Diseases. 1983. Horst, R. K. APS Press, St. Paul, MN 50 pp. Diseases and Pests of Ornamental Plants, 5th ed. 1978. Pirone, P. P. Wiley-Interscience Publication, New York, NY 566 pp. Diseases of Annuals and Perennials. 1995. Chase, A. R., Daughtrey, M. and Simone, G. W. Ball Publishing Co., Batavia, IL. 202 pp. Diseases of Floral Crops, Volume 1 and 2. 1985. Strider, D. L. Praeger, New York, NY 638 and 579 pp. Diseases of Herbaceous Perennials, 2009. Gleason, M. L., Daughtrey, M.L., Chase, A. R., Moorman, G. W., and Mueller, D. S. The American Phytopathological Society, St. Paul, Minnesota. 280 pp. Foliage Plant Diseases Diagnosis and Control. 1997. Chase, A. APS Press, St. Paul, MN. 168 pp. Geraniums IV. 1993. White, J. W. Ball Publishing, Geneva, Illinois. 412 pp. Herbaceous Perennials: Diseases and Insect Pests. 1987. Daughtrey, M. and Semel, M. Cornell Information Bulletin 207. How to Control Orchid Viruses. The Complete Guidebook. 1989. Wisler, G. C. Maupin House Publishers, Gainesville, FL 119 pp. Integrated Pest Management for Bedding Plants, a Scouting and Pest Management Guide, 2nd edition, 2000 (with color illustrations). Casey, Christine. IPM No. 407. Cornell Cooperative Extension, Ithaca, NY. 119 pp. New Guinea Impatiens. 1995. Banner, W. and Klopmeyer, M. Ball Publishing Co., Batavia, IL. 278 pp. Ball RedBook. 14th edition. 1985. Ball, V. Reston Publishing Company, Inc. Reston, VA. 720 pp. Managing Diseases of Greenhouse Crops. 1992. Jarvis, William R. APS Press, St. Paul, MN 310 pp.